Ousmane Dembele came off the bench to rescue a point for Barcelona in a 1-1 draw away to title rivals Atletico Madrid. 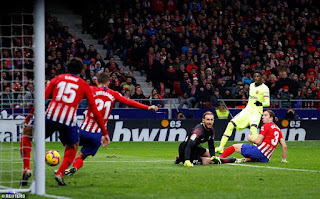 In a tense encounter, neither side managed a shot on target until Diego Costa's header in the 78th minute put Atletico in the lead. Atletico looked like they would hold on to take all three points, but Dembele scored a late equaliser for Barcelona.